My sister Jen requested that for Memorial Day, and in honor of the men and women who have given their life for our freedom, I rerun the blog post I wrote back in 2008 when Bill and I visited Normandy, France, during our European Adventure. That visit will always be one of the most profound experiences in my life, and something I will never forget. She also asked me why in the world is the beach that was stormed on that rainy June day back in 1944 called Omaha Beach. I, of course, being the astute history scholar that I am, had no idea. So I Googled it. From what I can tell after quick research, no one knows quite for certain how the names Omaha Beach and Utah Beach were chosen. They were code words for the battles. It seems likely that they were chosen because they were easily understood over radio airwaves and easily communicated through Morse Code. Some say that the US Military had noticed that the Germans chose code words that were quite easy to figure out — Operation Sealion for an amphibious assault, for example. Both Omaha and Utah are landlocked, thereby giving no clue to a water ambush. One theory is that they were named after two carpenters — one from Omaha and one from Provo, Utah — who helped build the headquarters for the invasion planners. That seems unlikely to me, but then again, Ike didn’t really keep me posted on his thoughts. There were, in fact, five beaches involved in the June attack — Utah and Omaha (U.S), Gold and Sword (Great Britain), and Juno (Canada). Each country selected the code names for their attack. The reality that these literally thousands of men who jumped from their boats onto the beach knowing full well that there was a likelihood that they would be killed simply takes my breath away. I am filled with love, honor, respect and gratitude for these men, and for all of the men and women who have served since, and who continue to serve today. Happy Memorial Day. God bless America. Here is my 2008 post from Reluctant Traveler…..
After spending the entire day yesterday looking at the various sites of the battles that were fought to liberate France, and eventually to win World War II, as we drove home I asked Bill how he felt. “Pretty proud to be American,” he answered. I knew exactly what he meant. The day was kind of dreary, one of the few overcast days we’ve had during our entire adventure. It couldn’t quite make up its mind – it would drizzle, then the sun would peak out of clouds. It never quite rained. The weather suited the day, we felt. The weather was overcast too on June 6, 1944. Traffic was awful. Everyone was on the autostrada getting away for holiday. What should have been an hour-and-a-half drive took us twice that long. Since we only had a day, we decided to focus on the areas in which America had the impact. As such, we only saw the Canadian cemetery in the distance as we drove by, and the same was true for Sword, Juno, and Gold Beaches, where Great Britain and Canada soldiers came on shore. Our first stop was just above the little French town of Arromanches, high on the cliffs above the Normandy beaches, where there was a 360 degree theater. The film shown on this circular screen was powerful. The film director intermixed current scenes from the little towns that line the Normandy coast with film taken on June 6, 1944, as our soldiers stormed the beach. There was no dialogue, and the only sounds you heard were the sounds heard by the soldiers as guns fired and planes flew overhead, or the sounds of a peaceful rural French life. The 1944 scenes were graphic, violent, poignant, and awe-inspiring while the current scenes were pretty and colorful and filled with joy. The contrast made a very strong point – the towns around the Normandy beaches owe their freedom from the Nazis to the United States of America and the other allies. 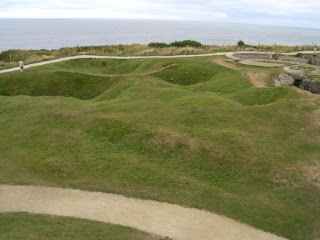 After viewing the film, we got back in our car to drive to the little French town of Longues-sur-Mer. Here we stopped in a small boulangerie and picked up two ham, Gruyere cheese, and tomato sandwiches smeared with good French butter, and two wonderful pastries for dessert. We then drove a few blocks towards the sea, to an area where there were four German bunkers with their guns still intact. These guns had the ability to shoot up to 13 miles. The clear shot the Germans had of the beach was absolutely bone-chilling. We ate our lunch at one of the little picnic tables they had set up for that purpose. As we ate, we tried to figure out how the French bakers can get the baguette so perfectly crusty on the outside and so chewy and delicious on the inside. It’s a reality I will continue to ponder. Our next stop was Omaha Beach, and the American cemetery. We walked through the museum, which gave a lot of information about the events leading up to the war, and even more interesting (at least to me), the events and discussions that went on during the days just prior to D-Day. While I could always imagine how much thought went into planning a battle such as that fought on June 6, I had never really realized that the Americans had tricked the Germans into thinking a bigger battle was going to be fought elsewhere. The Americans used false communications, fake airplanes, and other kinds of trickery that helped catch the Germans off guard and lulled them into thinking that, even as our soldiers were storming the beaches, this battle was not to be taken that seriously. After looking at the beach, we walked back up to the cemetery. Of course, the sight of all of these white marble crosses and stars of David is poignant beyond belief. Each marker has the name and rank of the soldier and the day he died. I always forget that the battles of Normandy went on not just for this one day, but for months. There are a number of markers that bear no name, but say only God knows who he is. Very sad. We left the cemetery and drove a bit further up the coast to Pointe du Hoc Ranger Monument. We decided to stop here at the last moment, and I’m glad we did. Pointe du Hoc was an area where, early on June 6, 300 US Army Rangers climbed the cliffs of this heavily German-fortified position to secure it for the allies. They were successful, but only after losing over two-thirds of the soldiers. Out of the 300 Rangers, 95 survived. The area was heavily bombed and the huge holes where the bombs had dropped are amazing and a somber reminder of the power of those bombs. Our last stop of the day was in Ste Mere Eglise, the first town to be liberated by the American soldiers on June 7, 1944. This pretty little town is in the general area where the 101st and 82nd Airborne soldiers dropped early on June 6 to land behind enemy lines. If you saw the movie The Longest Day, you will recall that one soldier got caught on the church steeple and played dead for a number of hours while German soldiers took shots at him. As he hung helplessly, he watched the ensuing battle below. The people of this town, to this day, have American flags hanging and have a parachute with a dummy hanging on the steeple of the church in commemoration. It had been a long and somber day, but one that made me very proud.